A rain garden captures rain from rooftops, driveways, yards and streets. A rain garden is a depression or a shallow bowl made in the landscape that is level from side to side and end to end. Runoff that travels to a rain garden is temporarily ponded - but it doesn’t stay ponded for long. Capturing runoff in a rain garden allows water to infiltrate into the soil rather than run into storm drains. Dirty runoff that enters storm drains is sent directly to "receiving waters" - our rivers, streams, lakes, ponds or wetlands. Rain gardens are an infiltration-based storm water management practice that relies on soils with good percolation rates to help manage rainfall to protect water quality. By installing rain gardens, homeowners can create landscapes that add beauty, wildlife habitat and interest to a yard while helping manage storm water more sustainably. Rain gardens are a key practice for creating landscapes that are both beautiful and hydrologically functional - that is - landscapes that hold and infiltrate rainfall rather than generating runoff that causes water quality problems and contributes to flooding. 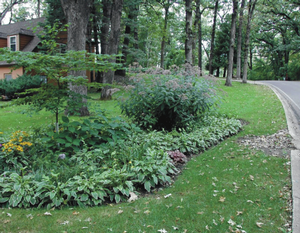 Read the full Iowa Rain Garden Design and Installation Manual here!